March. Baseball teams are in Spring Training in Florida and Arizona. Tomatoes are growing in a protected location with 'bottom heat' so they can be set out in the garden close to the end of April. We've all heard the old saying about March coming in like a lamb and going out like a lion, or is it coming in like a lion and going out like a lamb? Whatever the exact saying, it correctly alludes to March as one of the more schizophrenic of our months; certainly true as far as gardening goes. On one hand, we are still tending our winter vegetables, cabbages, broccoli, cauliflower, and lettuce, while on the other we need to be planning and planting what we will soon be eating in summer. Those of us on the coast can continue to plant more winter vegetables if we haven't had our fill of all those cabbage-family plants. I usually find I can grow almost all the winter vegetables right on into late May in most years. Some of the winter veggies will 'oversummer' for us; leeks, fennel, chard and kale will hold on in most summers although they can look downright ratty once our June Gloom has left us. Even lettuce, if we don't have those hot and dry Santa Ana winds scorching through here too much. Even if you have lettuce that doesn't bolt (run to seed), you will find very bitter if it gets too much heat. Royal Purple Pod beans can be planted even in February, and certainly by mid-March, I'll have a row growing. This is the only bean that will germinate in cold, wet soil and they are worth growing even when you can plant the more traditional 'green' green beans. I have had good production from my Royal Purple Pod beans even when snails have completely defoliated the plants. They taste great and turn a deep green at the exact second they are perfectly al dente, which is the way I like them. All other beans, in most years, will need to be planted no sooner than late March or early April because of their need for warmer soil. You can buy tomato starts in March, but I wouldn't want to plant them out until later in the month. Tomatoes will survive cool soil, but they will only thrive in warmer soil. If you want to grow tomatoes from seed, I usually sow mine in February. I start them in a location sheltered from insects, but still in direct sun – I use a grow mat that warms the soil to about 70° so the tomatoes get off to a good start – I sow basil the same way at the same time. Other summer crops I start in pots to be transplanted later, including peppers, eggplants and okra, need more heat so I don't even mess with those until after mid-March. They will be ready to plant out into the garden come the first of May (allow about 6 weeks to get them up, up and away). I'm awfully fond of lettuce. One of my Summer rituals is making a big production out of the First BLT of the Year with the L and the T coming from my garden – if I'm lucky I'll have also baked the bread myself too. The hard part is getting the L and the T to cooperate with the vagaries of weather. Tomatoes love heat and to really fruit they need temperatures above 84° while most lettuce is positively allergic to temperatures above 75°. There are some varieties of lettuce bred to be less heat sensitive – Jericho and Summertime are the two I'm most familiar with – look for them in seed catalogs and try planting lettuce plants on the north side of taller plants to give them more shade. In a fit of fanaticism, I once grew lettuce year round. I created a bed just for lettuce. I stapled a copper snail barrier to keep those salad lovers out to my wood box, and set up a series of little misters to spray the plants twice a day with a cooling mist. But the most significant feature was an old window screen (frame and all), resting over the plants on four 18” wooden stakes (easily purchased at a local garden supply store). The screen proved to be the most effective part of the whole operation. I was able to grow lettuce thru the brutal Californian summer right on into the middle of October, when a heat wave and an irrigation failure contrived together to completely fry the remaining plants. Fried lettuce has about the same appeal as month old sushi. If you want lettuce all summer you might give this – or some variation – a spin in your garden. Now that we've gotten ourselves into the garden and have a few things growing, I want you to begin to think about your soil. Here's a lovely little exercise that will tell you more about your garden soil: Dig into a place in your garden, going down about nine inches. Try to get below any mulch and get into the area where the roots will live. Get approximately a cup's worth of soil and put it in a pint container. Add a tablespoon of alum, you can find a lifetime supply in the spice section of any supermarket. Fill to within ½ inch of the top with water, cover tightly and shake vigorously. Allow this to stand for at least an hour, but 24 hours is better. Now observe what you have in your jar. Observe carefully without disturbing the water too much. You will see that the soil has self-sorted into layers. The bottom layer is sand. The middle layer is called silt or loam and on top there is a layer of clay. The water should be clear, any floating debris in the water is mulch or compost material called organic matter. The thickness of the separate layers define your soil. If sand is the predominate layer, your soil is sandy and will not hold water or nutrients. If clay is the thick layer, you will need a large dose of patience because your soil is hard to work, but is more fertile than the sandy soil. If your middle layer is the fat one, your soil is the dream of every gardener around you and you should play the lottery more often because you are blessed with good fortune! Most of us, though will experience the two dominant layers operating together to create our own unique set of opportunities and problems. Every characteristic of clay soil is the opposite of a sandy soil. Silt is the 'silent majority' of the soil community. We all want silty soil. Few of us have it. Looking at this chart, you can see if you have a sandy soil, you will need to water more than a neighbor with a clay soil; like wise you will have to consider more nutrients because your soil won't store them. You will be able to plant earlier in the spring because your soil will be warmer than a clay soil, but you'll need to add a lot more organic matter more frequently. It isn't good or bad, it's just different. Sandy soil will more readily forgive mistakes of too much fertilizer, too much water and too much of psychosis because it holds nothing for any length of time. Not even a grudge. A clay soil is higher in nutrients for plants and takes less water to get a crop. But screw up with clay soil and it very much does hold a grudge for a lot longer. If you even walk on clay soil when it is wet, you can create clods that will haunt you as you try to plant later in the year. Neither, though is ideal. Silt, in the middle, is what gardeners dream about. A soil that is neither too much clay and is therefore easier to work nor too sandy that holds no nutrients for the garden crop. Organic matter is any material that used to be a plant. Technically, it is anything that used to be living, but I would rather you skip disposing your victims' bodies until you get to be a much better gardener. Stick to plant material for now. Yes, compost is one of the organic materials you can add to your soil, but it's not all. Anything that used to be a plant is fine. My preference is for slightly unfinished compost. And I'm glad you asked why, because I am dying to explain it. Finished compost is delicious. I love the stuff – but UNfinished compost has chunks in it that you can identify what it used to be – it hasn't quite broken down completely. This material still needs critters of all sizes to finish into a dark unidentifiable compost. Those critters are the key to soil fertility. They are multi-celled animals like earthworms or they are fungi or bacteria or critters that are a little of both, 'actinomycetes.' Penicillin is one of the actinomycetes – and that smell of good garden soil that smells musty and sweet? That smell is the smell of actinomycetes. We want to have all these creatures in the soil because the plants derive real nutrition from them as they decompose. This is the stuff that past generations have ignored and so tried to add fertility with various fertilizers. It only works for a little while. I don't have any scientific proof, but I do know from many years of gardening, we are being asked to buy a lot more stuff than we need. You will get big beautiful tomatoes if you use all those expensive fertilizers, but it's not a sustainable model and you'll get good tomatoes without the expenditures and save money. If you use fertilizers, I think the fertilizers either kill off the actinomycetes and fungi in the soil, or make your garden a very inhospitable environment for them. I'm not sure which it is, but I am sure that the addition of fertilizer in the long term ruins the fertility of your soil. And I believe this is true about chemical and organic fertilizers alike, although, organic fertilizers tend to be milder and therefore less harmful than the chemical ones. A few fertilizers, though are the exception. I have used, and if I need to, I will use again, including alfalfa meal and cottonseed meal. Alfalfa meal has nitrogen, but is noted for inspiring rather than hindering microbial activity in the soil. I have used it in the beginning of the summer garden as the soil begins to warm. I used to use it every spring, but I've gotten lazy and now only use it on occasion. Cottonseed meal is a provider of nitrogen and somehow seems to release the nitrogen over a long period of time, unlike most fertilizers that have a very short beneficial effect. If you elect to use cottonseed meal, go out of your way to find organic cottonseed meal – the commercial cotton crops are doused with unending amounts of chemicals, and many of the commercial fields are planted with genetically modified cotton these days. I haven't used cottonseed meal for about 6 years, although if I was putting corn, as the only example I can come up with, into a soil with marginal fertility, I would not hesitate to use it. Look at the list below. If you haven't yet, get orders off to the seed companies to get your seeds for the summer. Get cracking now and you'll reap huge rewards this summer! Black from Tula, Juane Flamme, San Marzano, Black Krim, Stupice and millions of others! You have to allow that I am not a fan of okra or eggplant. My choices are influenced from those around me that consider these plants more than just ornamental. I will tell you, few plants are rivaled for beauty in the garden; but that doesn't mean I'm going to eat them! By now you should have the beginnings of a beet harvest – and if you've followed my lead and put in some Golden beets, these sweet treats from the garden can be treated nicely this way. Other beets will stand in readily, but the golden beets in the juice is exquisite. With the beets sliced into thick slices, I parboil them to the point their skins will slip off easily, and they are just beginning to be soft enough to eat. They usually have to cool quite a bit, but once you can handle them, slip the skins off and compost. Put the beet slices in a skillet with orange juice. Add a little cinnamon or other spice you think will compliment the beets and saute until tender. Serve as a side dish to a simple, earthy meal. They are fantastic. Summer's harvest from last year include these gorgeous peppers (what did I plant last year?) and San Marzano tomatoes. Both were prolific and delicious. When summer is over, I don't want to touch another tomato, but by February, I'm gearing up for a fresh BLT where I've raised the T and L and baked the bread. Someone else has to take care of the B.
Valentines' Day marks my traditional weekend for starting my tomato crop for the coming year. I've become accustomed to the need to sow my tomatoes a bit earlier each year in recent times (global warming? ), but whenever I do my main crop of tomatoes, I sow plenty of basil seed at the same time – they grow well together as much as they eat well together. 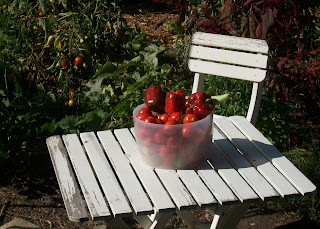 I have been seduced into starting an earlier crop of short-season tomatoes, lately. Territorial Seed Company has a list of 'ultra-early' tomatoes with names like Glacier and Northern Delight and sport 'Days to Harvest' declarations of something like 56. These plants top out about 18 inches high and produce tomatoes about 2½” in diameter – what I call a 'saladette' tomato – that are very tomatoey and tangy – more tangy than I like, but for the first tomato of the year, who's going to bellyache about that? I've even started these little fellows around the first of January! Whenever you start tomatoes, and whatever tomatoes you use, the procedures are about the same. Just remember that most tomatoes, with these ultra-early tomatoes being the exception, don't like to be planted into cold soil so wait until your soil has warmed (to about 65° at minimum!) before setting most tomatoes into your garden. One method of starting tomatoes I have done in the past used fluorescent tubes about 6 inches above the pots for the beginnings of tomatoes. This is opposed to starting them outside with a heating mat underneath to keep the roots warm and, with a sunny spot, I have found this works well enough. 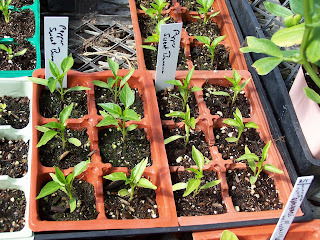 Peppers and eggplant, needing more heat, are started about 2 weeks later in the first week of March. All seedlings cannot be allowed to dry out and must be protected from predation, it doesn't take even a small critter (like snails and slugs or tomato hornworms) many bites to remove an entire plant when they are as small as this. More on the seed starting indoors shortly. Most of these big-leaved, vining plants like squash and cucumbers get a whitish powdery look long before they are done producing. This is called 'powdery mildew.' It is a fungus that gets on almost all of these plants and causes them to live a shorter life than they would without it. This is a common as cell phones around here, so close to the ocean. Until I find varieties that are resistant to it, I simply grow another plant to fill in when the first one succumbs. I don't spray for it because it seems a waste of time to me; if you spray, you must spray constantly and I just don't see it as being efficacious. I accept that the plants will get mildew and will die because of it and I make plans accordingly: Zucchini #1, funeral on July 8th. Zucchini #2, funeral on August 29th. Clear your calendar for composting service. Frankly any more zucchini than that is more than any person ought to have. With any amount of luck, February is our rainiest month which means we won’t need to be watering all that much. I have more or less permanently built up beds with paths between them, so walking through a wet garden isn’t that big of a deal. If your garden isn’t laid out like that, take care not to walk through the parts of the garden you intend plant when the soil is thoroughly soaked. Your footprints will compact the soil and cause needless grief later when the soil has dried out. Especially in clay soil. February is the last month we will want to prune dormant fruit trees. One cannot plan that they won’t have broken dormancy any later than this. See flowers? Or leaves? That’s “broken dormancy” in a nutshell, the sap is running inside the tree and pruning after once you see leaves or flowers will drain more of the tree's vitality – mind you pruning late won’t kill your tree, some folks do this kind of pruning regularly – it’s my preference to do my pruning with the least harm to the tree and for me, that means before the sap begins to run and that means December or January in my Zone 24 climate. I have learned over the last few years that my nectarine and peach trees break dormancy first and I need to consider pruning them in late November/early December. But I've proven that procrastination has its benefits! I find I can use the flowering branches for bouquets without causing a shortage of nectarines! I'm thinning that tree incessantly, even with a hard pruning to prevent too much fruit from weighing down and breaking the branches. Lateness in pruning hasn't stopped any tree I know from producing nor has it ever killed a tree. “There is slack in the universe,“ a teacher of mine used to say. Don’t forget to deal with slugs and snails. In these wet, cooler months, these destructive little mollusks multiply with alarming proficiency and can present huge problems. You cannot get rid of them forever. They are migratory, so even if you could rid yourself of every single one in your garden on Tuesday, you'd have a whole new supply by Friday from next door. And more on Saturday. It can be a discouraging thought! 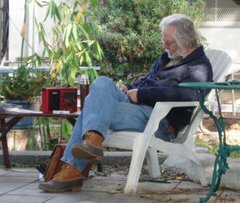 However, the only real way to deal with these transients is with persistent effort. You deal with today's snails today and leave tomorrow's snails to tomorrow. Sounds like something I heard before, maybe in yoga class? Some gardeners keep a five gallon bucket on hand with soapy water in it (one of those plastic buckets you see in a hardware store's paint department – cheap and rust free) and drop the critters in for a quick death. Others put a board down with one end slightly raised. Slugs and snails will congregate there over night and can be simply crushed with one swift footfall in the morning. Good for the soul. And soil. A fairly new product, 'Escar-go' is on the market and is non-toxic to mammals (you, your children and dogs and cats etc), and actually benefits the soil. Slugs and snails eat it and die. Probably not as humane as crushing them, but more acceptable in polite society. Broccoli is being harvested, along with cauliflower, cabbage (clean those slugs! ), peas, scallions, carrots, radishes, beets, new potatoes, chard, kale, and lettuces by the bushel. The garden looks stellar at this time of year, it is bursting with produce of deep green, blue green, punctuated with red and yellow (chard and beet) flags. Heads of broccoli and cabbage show off their refulgent harvest, while the tops of carrots and beets peek out from their cool soil homes. Peas hang delightfully from those bright green plants, with colorful poppies in outrageous bloom and the honey scent of sweet pea flowers in their lovely pastel colors wafting on cool breezes across the garden. Freesias are towards the end of their bloom cycle (there's another heady scent!) and the first of my climbing roses (which are not pruned as hard as shrub roses) are beginning to show off in the Southern California garden. Don't stop planting lettuce; I will continue to start seeds of lettuce right up through May. I have it easy being so close to the Pacific Ocean – here, cool season plantings can stretch through all months except late July through late September. Warm season crops aren't nearly so flexible because our night temperatures don't get all that high – the soil is cool and hardly gets warmed up enough for the summer crops until July. Tomatoes and cucumbers. However you say it, cucumbers and tomatoes are the number one plants gardeners think of when they think “Summer Garden.” There are more varieties of tomatoes than there are potholes in the greater Los Angeles area. These days I could say, there are more varieties of tomatoes than potshops in the greate Los Angeles area, too. Just check out the offerings of the members of Seed Savers Exchange: They list page after page of tomatoes. Tomatoes come early, mid-season or late. Tomatoes are cherry, saladette, plum and beefsteak as well as black, cream, green, red, striped, yellow and many shades in between. Tomatoes come as plain ol' tomatoes or heirloom, and (had enough choices?) determinate and indeterminate. It's a complete overwhelm of choice. Determinate tomatoes are similar in growth to bush beans, giving you short plants that bear all at once (more or less), while indeterminate are like pole beans that bear over a long stretch and get quite large to boot. Orange Sunshine – lots and lots of very sweet little tomatoes! As of this writing, only available as a hybrid, which I usually try to avoid, but I hear some folks are working on breeding it out to an open pollinated variety. Jaune Flammee (I)– a lovely bi-colored tomato (give it something to climb on!) that is red outside and gold inside – good tasting and beautiful! Green Zebra (I) – yup, it's ripe when it's green. I think they are little too acidic, but plenty of my friends like 'em. Moonglow (I) - Solid orange meat, few seeds and wonderful flavor. A favorite of any one who grows it. Black from Tula (I) – not really 'black,' but a very deep red. Delicious, though not a heavy producer – the skin is so thin I think it's best to take your plate and fork to the garden and eat it right at the plant! Stupice (D) – a small early plant that is worth growing because they also taste good and come in quick! You'll notice I didn't include any of the Best Boy or Early Girl or other common hybrids. It is true they are productive and will give you a good crop of bright red fruits, but I think they are too acidic and have tough skin, so I don't grow them at all. Also, with multi-national corporations buying out seed companies (read 'Monsanto' here), many of those hybrids are now owned by companies that sell genetically modified plants. These old hybrids are NOT GMO, but the profit made from home gardeners buying seeds from Monsanto goes towards their GMO research. No thanks. Besides, there are so many delicious tomatoes in this world, to stick to those few seems silly to me. I grow my standards (San Marzano, Jaune Flammee, Black Plum and Garden Peach) but I always experiment with some new tomatoes every year! Plant lots of basil and marigolds at the same time you plant your tomatoes as they make good companion plants and help deter insects. So right about now is when you want to begin to start seeds for your summer garden, if you have a protected place to sow the seeds. You don't need a greenhouse or a cold frame, though both of these can help. It is possible to start seeds in an apartment without any decent balcony space. I did it for a good many years as I bounced from tiny apartment to tiny apartment. Come February, I religiously put seeds of my regular tomato crop and lots of basil under the lights. By the way, it is a law of nature, Lord knows I don't make this stuff up I merely report it, but if you need one plant of something, start seeds for six! If you start one seed, it will fail – might be loneliness, I don't know, but it absolutely will not survive. However, if you grow six, they will all live. Give the other five away, you'll make other people happy and there is no better way to make yourself happy. Works with other things too, not just plants. If you have a little space – when I started I didn't have much! – you can start seeds on a table indoors. All you need is an inexpensive 'shop light' fixture – usually you can find them for right around $20 – add a couple of cheap 'cold' fluorescent bulbs – you CAN pay more, even more than $20 for 'full-spectrum' bulbs, but you don't need them for growing seedlings. If you were growing plants under the lights to full maturity, springing for the extra oomph of bulbs that have more of the light spectrum is useful, but for the quick trip your seedlings will have before they go out doors, getting more expensive lights is a waste of money. The cheap bulbs are called 'cold' light because they have a preponderance of cold – blue spectrum – light. They will need to be close to your seedlings, but that won't be a problem. I used bricks to prop the lights up to the height I needed for my seedlings – you might find other, more attractive solutions. My choice was based on what I had lying around for free and bricks it was. To raise the lights required adding a brick to each end – it wasn't “pin point” control, but it worked. Florescent lights do not distribute light equally along their length. The center has the most light and the ends the least. They also begin to loose effectiveness as soon as you start to use them. I think three years is all you can get from a florescent bulb even though it will still be putting out light. Your seedlings will get leggier when the bulb fails to put out sufficient light and it's a sign that it's time to move on. When I installed a fresh tube, I would record the date with a Sharpie on the light so I had an idea when to replace it. Our eyes cannot clearly tell the diminished output, but the plants suffer. The surface where this is placed needs to be waterproof. In addition to watering my plants, I frequently misted mine (sometimes I got them twice a day; which was my goal, but I made that goal infrequently). One of the hardships we place on indoor plants is the lack of humidity in our homes. Misting helps mitigate that. In addition, some of your watering will inevitably spill over making a waterproof surface essential – or, if not waterPROOF, at least water-impervious. You don't want to warp an antique dresser or something. In addition, I provided my plants with a small fan. It was one of those oscillating fans which would blow on the plants as it swept back and forth the length of the trays. This accomplishes several things. It makes for stronger plants; swaying in the breeze builds a stronger stem and helps create a stockier plant. The circulating air also kept fungi at bay – especially the fungus called 'damping off.' 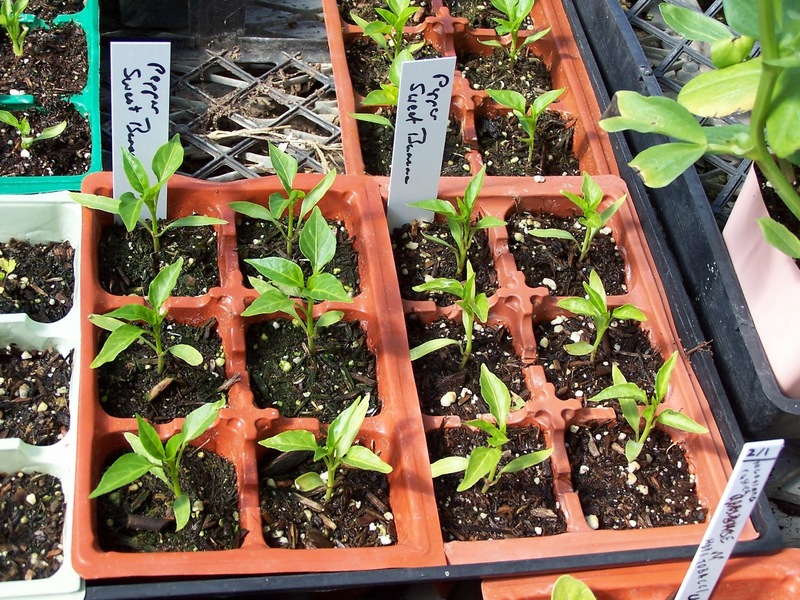 This is a killer of baby seedlings that has broken a lot of gardener's hearts. You say goodnight to your babies that are lovely little sweeties in the evening and come back to say 'good morning' in the dawn only to find your little darlings all 'cut' off at the soil surface. Another part of seed starting is to use a potting mix that favors the seedling. I have found a simple combination of peat and vermiculite (very fine perlite works too). One part of peat for each part of vermiculite gives a person a very lovely seed starting mix that will hold a lot of water and get the seeds sprouted. It is not wise to leave them in this water-retentive mix much beyond their first true leaf stage if you can help it. 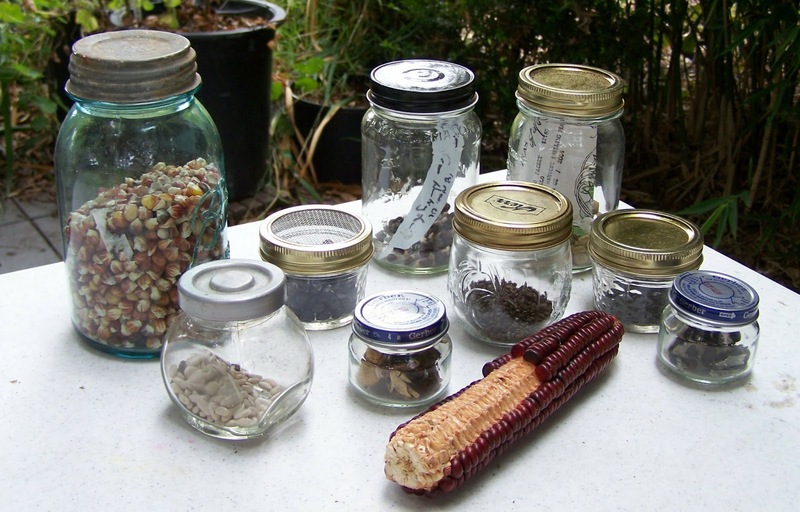 If you are not doing a lot of plants from seed, you can also use a regular good potting soil and get out any big chunks of anything by sifting it through a riddle. Really fine seeds like snapdragons may require you to screen the potting soil down to a very fine size, but most seeds can survive pretty good in only a coarsely sifted potting soil. With your shallowly planted seeds, it is imperative that you keep that top layer of soil moist. It need not be wet, but consistently moist. This is very different from how you will water your regular garden, which should be much less frequently and much more thorough. Bring coffee to a boil in a sauce pan, add vanilla, sugar, salt, and other spices. Simmer for a minute and add the chocolate in chunks. Whisk until it thickens from the melted chocolate; add milk and simmer for another minute to warm throughout. Whisk it to froth and serve at once to your Valentine. It's a winner.